DOWNTOWN — Early in this past baseball season, two books stayed snug together near my desk, on my nightstand or in my carry-on — constant tagalongs as I studiously picked through them for insights and inspiration. Both were biographies. Both were well written. One was a narrative frolic merrily skipping through a Hall of Famer’s past with the crystal-clear reverence of a fan. The other was more of a narrative ordeal, a no-quarter-given examination of a Hall of Famer, warts and glory, that shows what happens when the lens through which a fan views a hero cracks. The books served as compelling companions during a season because not only did the writers take similar, intensely personal angles on their subjects — rather than the detached, stoic eye of a stodgy biographer — to arrive at different views, the books were also about two icons of the sport, one fading from his prime as the other shot to stardom: Stan Musial and Mickey Mantle. These are the players that bind generations in my family. My grandfather, a Wisconsin native, grew to love the St. Louis Cardinals through KMOX/1120 AM, and through enjoying the Cardinals came to admire Musial. How could you not? Musial was the greatest player in the league when my grandfather found comfort in a 50,000-watt radio single and the games it brought him. My father, also a Wisconsin native, felt jilted by his Milwaukee Braves and latched onto only the most charismatic and outsized talent on the game’s most famous club. How could he not? Mantle had the grin all the girls adored and the swing all the boys borrowed. My introduction to the history of baseball came through these two portals: stories of “The Man” and his Cardinals from gramps and highlights of “The Mick” and the Yankees from my dad. These were the tall tales of my youth. A Bunyanesque reverence for both players was my inheritance. I think that has something to do with why I started reading the books at the same time. Jane Leavy’s stunning The Last Boy left me exhausted as she peeled away the image of Mantle and laid bare the marrow. The otherworldly feats were there, illuminated anew, but so too were the disappointments, the truth. Nothing was spared, and in between those chapters it felt good to seek calmer harbor in George Vecsey’s Stan Musial: An American Life. The books intertwined for me in the same way the stories from my father and grandfather did. Musial flirted with a Triple Crown in 1948. Yeah, well, Mantle won one 1956. Musial was idolized by his peers. Mantle was a great companion (drinking, etc.) for his. Musial set the tone for the Cardinals that would follow him. Mantle, in one of the most glorious passages of Leavy’s book, once showed up royal Joe DiMaggio by, gasp, interacting with fans instead of mechanically firing off autographs. Being in St. Louis and being around baseball in St. Louis has brought back those memories of my grandpa and the little things he’d say about the Cardinals. I don’t think I would have forgotten them, but I do have a deeper appreciation for them, just as I do for my father’s fondness for Mantle. Stan Musial talks with Mickey Mantle at Yankee Stadium. The Warm-up, which happens annually in January, is usually good for some surprise news for the paper and always good for a surprise souvenir from the vendors. It is often nothing more than a single baseball card that grabs me. In 2011, it was a box of Fleer baseball cards from the over-printed days in the 1990s that cost me roughly $6 for 2/3 of a box. Several years ago it was a photo of Babe Ruth talking with “Shoeless” Joe Jackson on a bench, a bat between them and the sweet spot holding their attention. I eyed that framed picture for a few years before buying it. It’s now in my office. This year, I had little time and less hope of finding something unique. That’s when I saw a gentleman leafing through a stack of black-and-white photos of Mickey Mantle. There he was in a Joplin uniform. There talking to Roger Maris. There driving the ball. There catching one. There running the bases. There in the batting cage. 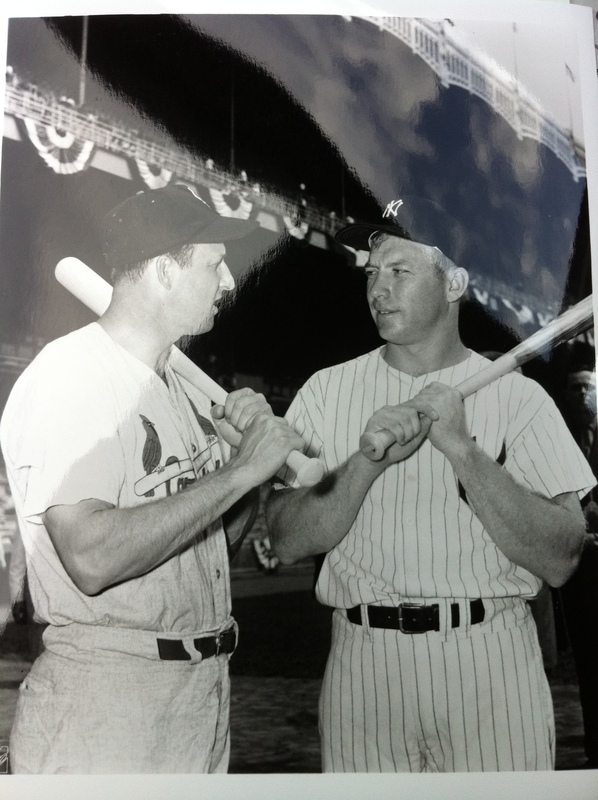 And there … talking to Musial. Yankee Stadium’s famous facade looming behind them was lagniappe. I’ve attempted to describe my relationship with my grandpa through baseball before (I’ll post that story immediately following this one). Here was a picture that reminded me of him because it bridged the generations of stories I grew up on. This was my grandfather’s favorite player talking with my father’s favorite player and as soon as I get it in a frame it’s going in my office where I sometimes get the pleasure of writing about both. The cost of such a prize: $4. This entry was posted in baseball, journal, project 365+ and tagged baseball, cardinals, kmox, mickey mantle, st louis cardinals, stan musial by dgoold. Bookmark the permalink. I finished the Vecsey biography last week and loved it, but it made me so sad at the end. One wonders how much Stan remembers and if he would, indeed, be up to a “2nd attempt” to truly honor him. I am now reading the Wayne Stewart biography, but haven’t gotten far yet. The goal is to read up before March, when my family and I are lucky enough to see a spring training game. Wayne’s is good. It’s more of a direct-approach biographer. There’s a lot of material in it from The Post-Dispatch, Bob Broeg and so on. Enjoy the spring training game. It’s one of the best times for baseball because of how close fans can get to the players and, more importantly, the game.